Derived from the Roman word “aqua,” meaning water” and “mare” meaning sea, Aquamarine Stone gem does indeed resemble the color of seawater. A member of the beryl family, it was first mined in 1811 in Brazil, but the earliest documented use of an aquamarine gemstone is by the Greeks, around 480 to 300 BC. Aquamarine stone occurs primarily in granite pegmatites and to a lesser extent in granite vugs. It is also in hydrothermal carbonate veins and greisens. It is typically associated with quartz, feldspars and muscovite, and often occurs with other common pegmatite minerals such as biotite, garnet, phenakite and topaz. Because of aquamarine’s relatively high hardness and specific gravity, it is sometimes found in eluvial and alluvial deposits. Crystals are often elongated along the c-axis creating the effect of appearing wand-like or pencil-like. Aquamarine stone is known for having long, hollow tubes. Though rare, if there are enough of these hollow tubes, chatoyancy or asterism (also known as cat’s eyes or stars) can be produced with proper cutting. The name aquamarine has been used as a modifier for many other materials such as aquamarine tourmaline, aquamarine emerald, aquamarine chrysolite, aquamarine sapphire, aquamarine topaz, etc. It has even been used to describe the sea, the skies, some General Motors cars, or other pale to medium blue objects. Aquamarine stone is pastel blue, greenish blue, or green-blue. The preferred aquamarine color is a dark blue to slightly greenish blue with moderate intensity and is most striking in gems of over 5 carats. Fine stones show even blue color with no zoning. 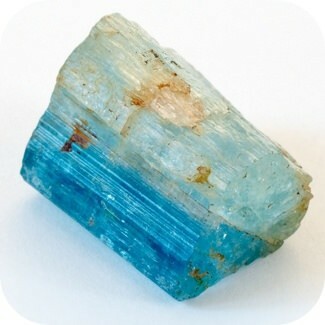 Madagascar was the historical source of aquamarine. Today, Brazil is probably the most prolific supplier. Other important sources are the African countries of Tanzania, Kenya and Nigeria. Also Sri Lanka, Afghanistan, the Ural Mountains in Russia, Pakistan and India. In the US, Colorado has some high quality aquamarine. It is found in the mountain peaks of Mount Antero and White Mountain. Composition: Beryllium, aluminum, silicon and oxygen that is normally without color. Lore attributes the power of foresight, happiness and courage to those who wear an aquamarine stone. It is considered a symbol of honesty, beauty and loyalty, and both increases intelligence and extends youth. In alternative healing, aquamarine is considered to be an effective healing stone for anxiety and insomnia. In the Middle Ages, aquamarine was also thought to have a poison-reducing effect. It is said that aquamarine stone is particularly powerful when immersed in water which is bathed in sunlight. Water in which this gemstone had been submerged was used in ancient times to heal a variety of illnesses of the heart, liver, stomach, mouth and throat, as well as, cure hiccups. It has been called the “treasure of mermaids”, with the power to keep sailors safe at sea. Sailors once believed that carrying an aquamarine would bring good luck and safety on the seas and protection against seasickness, especially if the stone was engraved with the Poseidon chariot. A dream of aquamarine was said to mean you would meet new friends. Over the centuries, the gemstone has been said to protect against the “wiles of the devil”; to wit, when held in the mouth, aquamarine stone could enable one to call a devil from hell and receive answers to any questions asked. Though aquamarine gemstones are not completely flawless, they do not have many natural inclusions. The transparent rough crystals are usually “eye clean”. The most common eye visible inclusions are raindrop-like needles which can be clearly seen under magnification. Inclusions in aquamarine may include mica, hematite, liquid-filled (often salt-water) tubes and hoses. The liquid can expand considerably if the crystals become overheated, causing them to fracture badly, or in rare instances, to explode. Beware of misleading retail labels. “Brazilian Aquamarine” is actually a blue topaz. Also, a gemstone known as “Siam Aquamarine” is heat-treated blue zircon. Because aquamarine gemstones commonly occur in large clean crystals, the size of the finished stone is not an important evaluation characteristic. The price is dependent on its clarity and the depth of color. For example a 40 carat very pale aquamarine gem will be worth the same as a very fine deep blue aquamarine of one carat size. Aquamarine stone has been the traditional birth stone for the month of March although some jewelers’ charts list bloodstone as an alternate. Most faceted aquamarines are free of eye-visible inclusions. Collectors generally expect clean gems with good transparency. There is a trend today to use included, but good-color aquamarines as unique centerpieces for jewelry articles or even as partially polished crystal slices or nuggets in necklaces. Aquamarine stone can be cut into almost any shape, but cutters often fashion them as emerald cuts or as round or oval brilliants. Many gem artists use aquamarine for one-of-a-kind designer cuts because their styles maximize the material’s pure, even color and high clarity. Aquamarine stone is available in large sizes—many fi ne gems of 25 carats or greater are readily available. Generally, smaller accent sizes are pale: cut gems are more likely to have a darker color if they are larger than 5 carats.